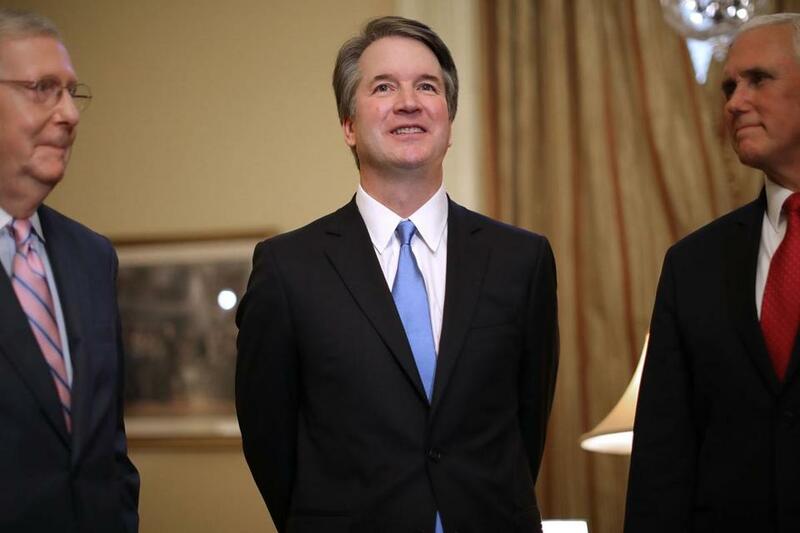 Senate majority leader Mitch McConnell, Judge Brett Kavanaugh, and Vice President Mike Pence before a meeting in McConnell’s office on Tuesday. For the last four decades, conservatives at the grass roots and in Washington have mounted a sustained, strategic effort to remake the Supreme Court. 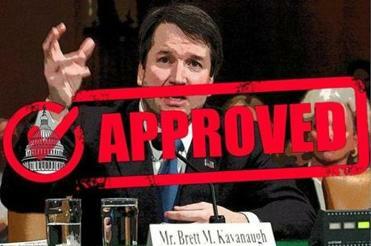 They’ve accepted compromises and setbacks along the way; they’ve held their noses and voted for candidates like Donald Trump; they’ve seeded lower courts with a generation of conservative jurists like Brett Kavanaugh, knowing it would take years for those efforts to translate into results. Through it all, groups like the Federalist Society never lost sight of what they view as the ultimate prize: A court that would overturn Roe v. Wade, the 1973 decision legalizing abortion nationwide, and other decisions that conservatives view as judicial activism run amok. The crusade to remake the high court along political lines has come at a high cost — and not just to the women whose reproductive rights it endangers. It’s demolished old norms, culminating in the unprecedented GOP refusal even to vote on Merrick Garland in 2016. To right-wing ideologues, though, it’s all worth it. Even for critics, it’s hard not to grudgingly admire their tenacity. Now that patient crusade stands at on the cusp of victory. With President Trump’s nomination of Kavanaugh to the Supreme Court on Monday night, hard-right conservatives will soon have a five-vote majority. All that’s left now is the Kabuki dance known as the Senate confirmation hearings — another casualty of the conservative judicial crusade, which has turned hearings into an uninformative charade designed to create a sense of process and deliver to senators like Maine Republican Susan Collins a pretext to vote for the nominee. There are some lessons in the conservative victory that’s likely to come: Politics work, elections matter, and enduring the occasional setback is worth it. On the other side of the aisle, liberals have never mustered the same level of discipline and far-sighted strategy, even though the court’s rulings also have direct implications for goals that liberals and Democrats claim to hold dear. Abortion and guns, to take just two, directly affect the lives of millions of Americans. A sincere commitment to upholding reproductive rights or enacting sane gun control — or protecting the environment, or upholding civil rights, or any number of other good causes — would require the same strategic approach to the judiciary as conservatives have shown, and the same willingness to subordinate short-term disagreements to long-term goals. How can senators decide whether to invest Kavanaugh with the immense power of a Supreme Court seat unless they find out what he would do with that power? Ralph Nader might be the most blatant example of the left’s self-destructive purity tests, but his 2000 third-party presidential candidacy that drained votes from the Democratic nominee was only a symptom. It might all seem like ancient history now, but consider the perfect-is-the-enemy-of-the-good mentality that nearly sank the Affordable Care Act from the left, or the absolutism that drove some environmentalists to support another third-party candidate in 2016 — helping to ensure a Republican president whose administration is wrecking environmental regulation piece by piece. Whether the Kavanaugh nomination, and the Trump presidency more generally, end the left’s Naderite distractions remains to be seen. Roe v. Wade was that wake-up call on the right, and it led to a cohesive political response. Make no mistake, a decision reversing or vitiating Roe would be disastrous for this country. But it’s a democracy, and millions of American voters, activists, and organizers cared enough to see the antiabortion cause through to this nomination. Do the grass-roots supporters of women’s rights — and environmental regulation, and labor rights, and civil rights — care enough about those causes to push back with the same kind of strategic savvy? Why is Clarence Thomas still on the Supreme Court?